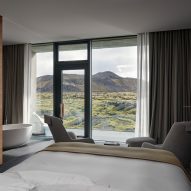 Guests at The Retreat at Blue Lagoon Iceland can look out onto the turquoise water of the famous lagoon from hotel suites nestled into the lava formations. 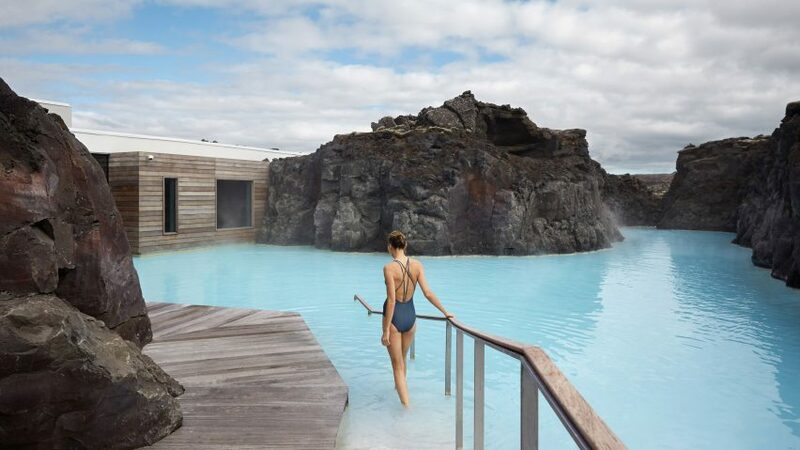 The Blue Lagoon is situated within the UNESCO Global Geopark and comprises a series of pools containing geothermal seawater rich in minerals like silica and sulphur that are reputed to be good for treating skin conditions. 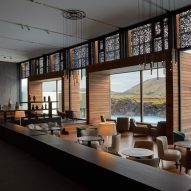 The original Blue Lagoon Spa, the subsequent Silica hotel and other extensions of the Blue Lagoon facilities were designed by Sigríður Sigþórsdóttir founding partner of Basalt Architects. 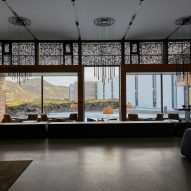 Sigurður Þorsteinsson and Design Group Italia, collaborated with Basalt Architects on the Retreat at Blue Lagoon. 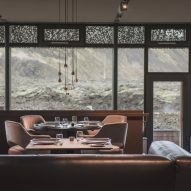 Over subsequent years the complex was expanded to incorporate a restaurant, and in 2014 construction began on The Retreat at Blue Lagoon Iceland. 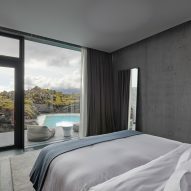 The new hotel represents the culmination of founder Grímur Sæmundsen's vision for the Blue Lagoon as an epicentre for health and wellbeing. The design of the retreat aims to take advantage of the lagoon's natural beauty and minimise the building's impact on its surroundings. A thorough analysis of the cracks and fissures that form this volcanic landscape informed the layout of the plan. A degree of flexibility was also incorporated into the design to enable the plan to adapt in response to unexpected discoveries during the excavation process. As a result, the building merges seamlessly with the environment and incorporates some of the natural features. "We wanted the lava, the moss, the water to be omnipresent, resulting in architecture that is woven in with the natural elements," the architects explained. "The bare lava forms the walls inside and outside and covers the roofs. The water surrounds, flows through and cascades, and the lush moss stretches all the way to the horizon around." 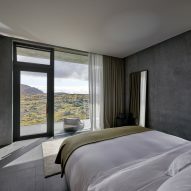 The material palette used throughout the project was chosen to complement the hues and textures of the landscape, with raw concrete, wood and lava from the site all used to harmonise with the natural surroundings. The predominantly concrete structure comprises elements that were either prefabricated or cast in situ. 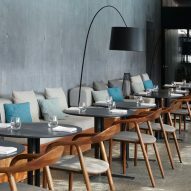 The exposed concrete is treated to create walls with different textures and tones that evoke the white silica or grey lava. 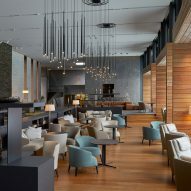 Custom-made facades and screens within the spa and hotel feature a dark-grey hue and perforated pattern that recalls the aerated surface of the solidified igneous rock. 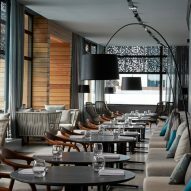 All of the furniture throughout the hotel was created by B&B Italia. 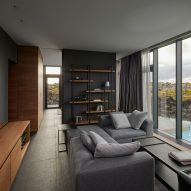 The 62 suites features a minimalist aesthetic, with floor-to-ceiling windows that focus attention on views of the lagoon or the moss-covered rocks. 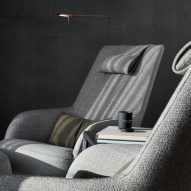 Lava is used in various forms throughout the interior to form surfaces and objects that root the building in its context. 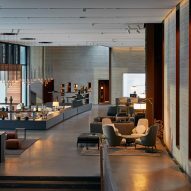 These include service desks in the reception area and a chef's table in the new Moss Restaurant made from lava rock that was quarried onsite. 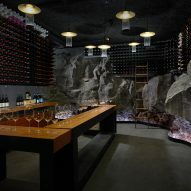 A wine cellar for the restaurant is enclosed by walls of exposed rock that are dramatically illuminated from below, with additional pendant lights contributing to the subdued ambience. 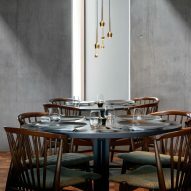 Dezeen recently featured a sculptural table made from volcanic rock by Icelandic studio Innriinnri. 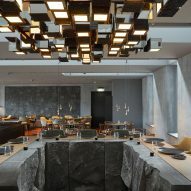 Formed from basalt, the designer submerged the table's two slabs in The Blue Lagoon to allow silica to infiltrate the material, resulting in a white glaze on the bottom part of the stone.